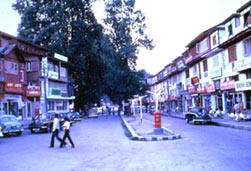 Kalhana, the author of 'Rajtarangini’, states that Srinagar was founded by Emperor Ashoka (3rd Century BC). The present city of Srinagar was founded by Pravarasena-II, and Hiuen Tsang, who visited Kashmir in 631 AD, found it at the same site as it is today. Laltaditya Muktapida was the most illustrious ruler of Kashmir in the Hindu period, which ended in 1339 AD. King Zain-ul-Abidin (1420-70 AD), popularly known as ‘Budshah’, was a great patron of Sanskrit. Akbar captured Kashmir valley for the Mughals, who endowed Srinagar with beautiful mosques and gardens. The Sikhs overthrew the last Muslim ruler in the reign of Maharaja Ranjit Singh in 1819. In 1846 the Dogras secured the sovereignty of Kashmir from the British under the Treaty of Amritsar, and in 1947 the state of Jammu and Kashmir with Srinagar as its capital, became part of the Indian Union. Its waterways with their own quaint lifestyle, the unique Houseboat, the blossoming gardens, water sports activities, shopping for lovingly hand-crafted souvenirs and the nearby resorts make it a cherished spot among those looking for a memorable holiday. Most houseboats on the Nagin and the Jhelum are situated on the banks of the lake, and can be accessed directly from land without the help of a Shikara. While all those on the Dal require a Shikara to get to and from them. Most houseboats on the Dal are situated in long straggling rows some face the boulevard, Srinagar's exciting address, while others are situated singly or in groups of two and three. The gardens all follow the same rectangular layout with a series of terraces rising one above the other up the hillside. Down the centre flows a stone channel carrying water through a series of pools and cascades. This system of carrying running water through the artificial cascades, and the layout of the fountains, was introduced to India by the artisans employed by the emperor Akbar. 'Bagh' means garden. 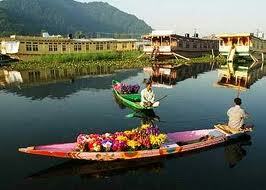 One can enjoy some of Srinagar's better gardens in a leisurely bike ride around the shores of the lake. Set some distance back from the lake, but reached by a small canal, the Shalimar were built by Emperor Jahangir for his wife Noor Jahan, 'light of the world' in 1616. 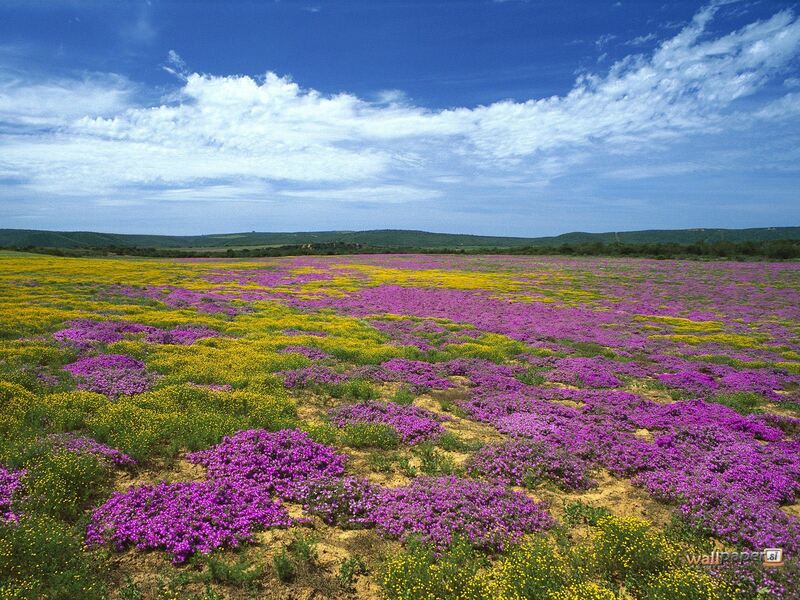 Although it is known today as the 'garden of love' it was originally named the Farah Bakhsh or 'delightful garden'. The garden is built in four terraces with traditional water channel running down the middle. The gardens measure 540 by 183 metres. During the Mughal period the top terraces used be reserved for the emperor and the ladies of the court and was the most magnificent. It include a pavilion made of black stone in the middle of the tank. Black Marble fluted pillars supported the pavilion, which was used as a banquet hall. Shalimar Bagh has an air of seclusion and repose, and its rows of fountains and shaded trees seem to recede towards the snowcapped mountains. A sound and light show is put on here every evening during the May to October tourist season. The Nishat Bagh is another lovely garden with its 12 terraces representing the 12 signs of the zodiac, which descend gradually and seem to almost merge into the lake. 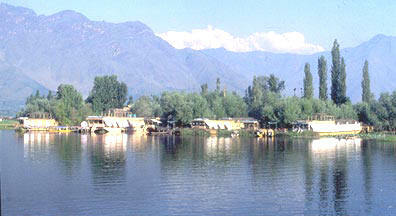 It is situated on the banks of world famous Dal Lake in the backdrop of Zabarwan hills. With its flowerbeds, trees, fountains, the Nishat presents a dramatic sight. The gardens were designed in 1633 by Asaf Khan, brother of Noor Jahan, and follow the same pattern as the Shalimar gardens with a polished stone channel running down the centre and a series of terraces. It's the largest of the Mughal gardens measuring 548 metres by 338 metres, and often the most crowed. The walks beside the channel are bordered with lines of cypresses and Chinars. Also found within its vicinity are some remains of Mughal period buildings including a double storey pavilion enclosed on two sides latticed windows. Directly behind the garden is the Gopi Tirth, a small spring gushing forth crystal clear water, which feeds the garden water. Smallest of the Srinagar Mughal gardens, measuring just 108 metres by 38 metres, the Chasma Shahi, or 'Royal Spring', are well up the hillside, above the Nehru Memorial Park. The fresh water spring in these pleasant, quieter gardens is reputed to have medicinal properties. The gardens were laid out in 1632 by Ali Mardan Khan and include three terraces, an aqueduct, waterfalls and fountains. The water from the spring supplies the fountains and then goes through the floor of the pavilion and falls to the lower terrace in a fine cascade of five metres, over a polished black stone chute. Some extensions have recently been made to the gardens. Like all the gardens the Chasma Shahi is open from sunrise to sunset but unlike the other gardens this is the only one, which charges admission. There is a small shrine, the Chasma.